This is the third article of our Living Tabernacles series, where we study the Tabernacle in depth. It is exciting to see how each element symbolizes some characteristic of Yeshua. It is also more challenging when we examine what each element means for us, since each of us is now a living tabernacle of YHVH. We are posting two articles each month as part of this series. In the first article in this series, Nancy studied the significance of the metals used in the Tabernacle. 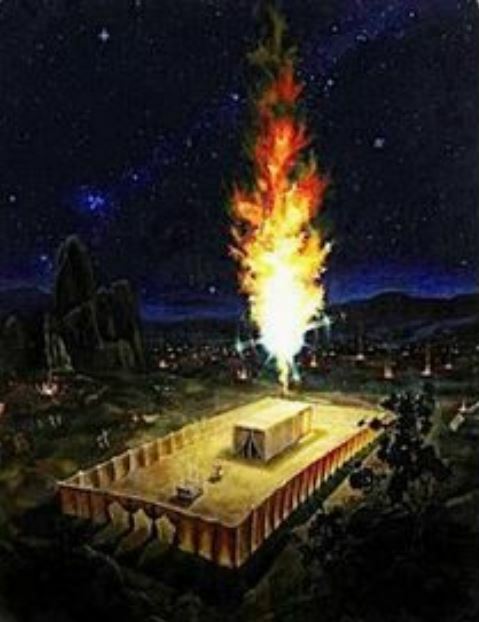 In the second article she examined the items YHVH specified in Exodus 25:4-5 as materials to construct and cover the Tabernacle. In this article we will cover the oil and spices to be used for the anointing oil and the incense in the Tabernacle. In Exodus 25:6, Abba tells Moshe that they are to gather from the people…”olive oil for the lamps; spices for the anointing oil and the fragrant incense”. Later on, in Exodus 27:20, YHVH tells Moshe: “Command the people of Israel to bring you pure oil of pressed (beaten or pounded) olives for the light, to keep it burning continually”. Yeshua is continuously our pure Light. When we think of Yeshua as the Light of the world, and His command to us to shine that light throughout the world, then we can see how important it is to keep that light shining through us 24/7. In Exodus 30:23-24 YHVH provides details of the ingredients and preparation for the anointing oil listed in Exodus 25, and how it is to be prepared – He says to Moshe: “Collect choice spices—12 1⁄2 pounds of pure myrrh, 6 1⁄4 pounds of fragrant cinnamon, 6 1⁄4 pounds of fragrant calamus, and 12 1⁄2 pounds of cassia—as measured by the weight of the sanctuary shekel. Also get one gallon of olive oil”. In Verse 25, He then explains how these ingredients are to be mixed together: “Like a skilled incense maker, blend these ingredients to make a holy anointing oil”. Note that YHVH has added yet another qualification to the anointing oil – as I highlighted in the last verse, it is referred to as a “holy anointing oil”. This tells us that it is to be set apart and made in a very special way compared to all other oils, such as the oil for the lamps. Yeshua baptizes us with the anointing oil of the Holy Spirit. Myrrh is a pale yellow gummy substance extracted from a small thorny shrub, typically used in spices and ointments. It is very costly and is known to be purifying to the body, and has a pleasant fragrance. Fragrant cinnamon oil is distilled from the bark of a special type of cinnamon tree. It is very tasty and is often used to flavor food because of its pleasant aroma. Fragrant (or sweet) calamus is a tall wetland plant with scented leaves – it is a fragrant cane whose root is highly prized as a spice. When it is crushed, it exudes a sweet fragrance. The more it is broken and crushed, the more of the fragrance that is exuded. In its spiritual application, the calamus speaks to us of brokenness, and reminds us that Yeshua was crushed and broken for us. There are times in our lives when we must be crushed or broken in order to be purified. Cassia comes from the aromatic bark of a Middle Eastern tree, and represents the true humility of anointed worship. It is sometimes used as a natural medicine. Cassia is derived from the Hebrew root “quadad”, meaning to bend or bow. This can be seen to represent us as God’s people, who are to bow down in humility before the strong hand of God (1 Pet. 5:6). The main ingredient by volume in the Holy Anointing Oil is olive oil, which has both secular and sacred purposes. The olive tree is very important in secular life for cooking, cosmetics and soaps, and as a fuel for oil lamps. The olive tree has been a symbol of peace and prosperity since the time the dove returned to Noah’s Ark with an olive branch. When Frankincense is burned it emits a fragrant odor, and hence the incense became a symbol of the Divine name (Malachi 1:11) and an emblem of prayer (Psalm 141:2; Luke 1:10; Revelation 5:8; 8:3). Stacte is generally understood to be the purest kind of myrrh; and as the Hebrew name implies a drop, it would seem to refer to this type of myrrh as dropping from the tree of its own accord, without any cutting. This makes me think of Yeshua’s precious teardrops of blood in Gethsemane. Onycha: Hebrew shechelet is thought to be the resin from a Mediterranean shrub that has been used for medicines and sweet perfumes for hundreds of years. Galbanum: this rather foul-odored spice, when mixed with all the other spices, produces a perfect mixture for the incense. An ancient story tells of a perfumer who experimented with the biblical incense recipe and discovered that when the galbanum was left out of the mixture, the other ingredients still produced a pleasant fragrance. However, when the galbanum was added, something quite wonderful happened chemically: “the full mixture of the spices, including the foul galbanum, smelled infinitely more delicious than the mixture without galbanum”. The experiment showed that the galbanum transformed the sweet spices to produce the most beautiful incense possible. In the same way, as saved believers, we are transformed through the cleansing of our “foul” sins into beautiful children of God. It is wonderful that YHVH explained to His people the precious spices they were to gather and use in the holy anointing oil and the incense, but we need to always remember that our obedience to Him is the sweetest aroma we can sacrifice to Him (1 Sam 15:22). Our prayers are the most powerful incense we can offer up to YHVH (Rev 5:8). The holy anointing oil that was to be used in the tabernacle can also be related to the oil of the Holy Spirit, flowing through our own tabernacles, purifying us and making us holy to stand before YHVH in His heavenly Tabernacle. Let us welcome the oil of the Holy Spirit to keep our bodies and souls pure and set apart from the lusts of the world, such as power, greed, arrogance, hostility and envy. We are called to be set apart to be with YHVH for all of our days, both here on Earth and forever in Heaven.